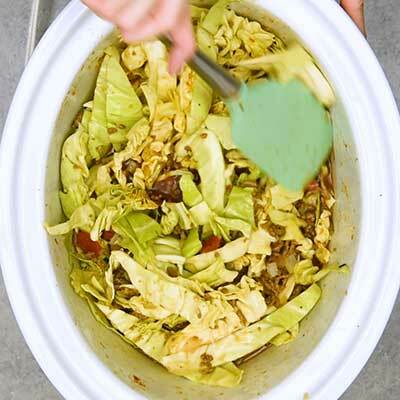 This easy crock pot cabbage roll soup gives you all the flavor of a cabbage roll but for a fraction of the work. Just fill the pot, let it simmer, then eat! Cabbage rolls are one of those fit-any-occasion meals, where they could be an appetizer, easy lunch, or filling dinner. The only downside? They take some time to make. Between preparing the ingredients and rolling up the rolls, you spend more time in the kitchen than you do enjoying the meal. And that, my friends, is exactly why I love cabbage roll soup: you get all the flavor you love but with a fraction of the effort. 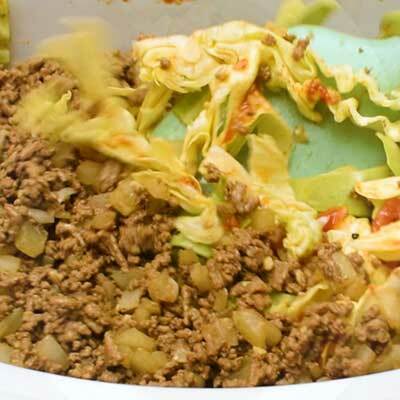 Is cabbage roll soup healthy? For the most part, yes, this soup is healthy. However, the soup does include rice and cooked beef, which may or may not fit within your diet or program. If needed, you can omit the rice (and reduce the broth by one cup or so) or the beef (or substitute for another meat of your choice). If you’d like to try a different cabbage soup that’s made to be healthier, check out this weight loss wonder soup. What else can you add to this soup? More spices, such as thyme, bay leaves, or brown sugar. Use anywhere between one teaspoon and one tablespoon, to taste. Different meats, such as ground pork. You could either completely substitute for ground pork or do half beef and half pork. What to serve with cabbage roll soup? Mashed potatoes. Starchy foods always help fill in the gaps of any dinner. I especially like making Irish colcannon. Can you freeze cabbage soup? Yes, you totally can! Soups are great for freezing in individual-sized portions, too. To freeze, allow the soup to cool to room temperature, then transfer to a sealable container or freezer bags. Soup can be stored in the freezer for up to two to three months. How long is cabbage roll soup good for? Once prepared, this soup can last in the refrigerator in a sealed container for three to four days. I recently upgraded my crock pot to one that comes with bowls for 2.5 Quart, 4 Quart, and 6 Quart and I highly recommend it! It’s so nice to have one unit that can make fabulous dinners and heat up party dips. You can pick one up here: Choose-A-Crock Programmable Slow Cooker, 6 quart/4 quart/2 x 1.5 quart. This recipe could be made in the 6 quart size. 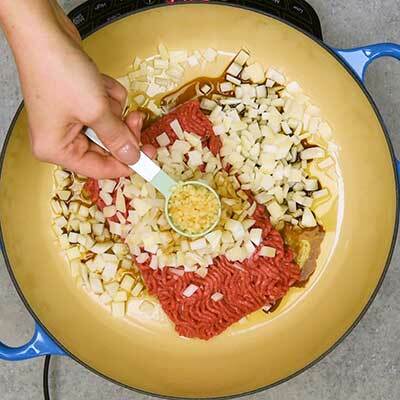 Step 1 – In a wide skillet, warm up the olive oil until nice and hot, then add the ground beef and onion, followed by the Worcestershire sauce, garlic, and paprika. Cook and crumble the ground beef until no longer pink. Drain the excess grease, then set the skillet nearby. 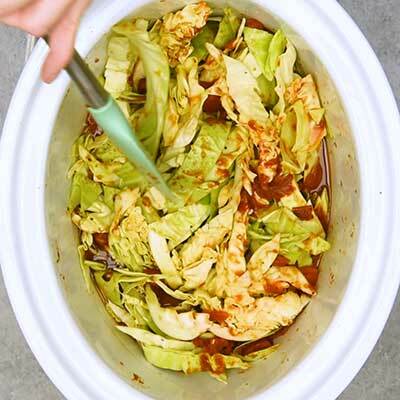 Step 2 – In a 6 quart crock pot, toss in the following ingredients: cabbage, beef broth, fire-roasted tomatoes, vegetable juice, rice tomato paste, allspice, and salt and pepper to taste. If needed, stir or rearrange the ingredients to make some room, then add the cooked beef mixture. Give the soup a good stir to mix everything around. Step 4 – Serve in some classy soup bowls with some chopped parsley for garnish. In a large skillet, heat olive oil over medium heat. Add ground beef, onion, Worcestershire sauce, garlic, and paprika to skillet and cook until beef is crumbled and browned, about 5-8 minutes. Remove skillet from heat and drain any excess grease. 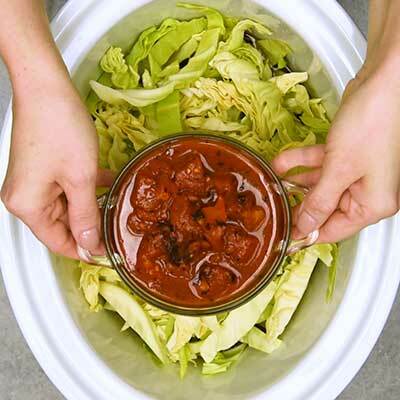 In a 6 quart crock pot or larger, add the cabbage, beef broth, fire-roasted tomatoes, vegetable juice, rice, tomato paste, allspice, and salt and pepper to taste. Gently stir or rearrange the ingredients to make room, then add the cooked beef on top. Stir well. Crock pot will be very full; this is okay, as cabbage will cook down. If desired, add up to 1 additional cup of beef broth. Cover crock pot and cook on LOW for 6-7 hours or HIGH for 3-4 hours. Serve cabbage roll soup immediately with parsley for garnish. Great soup for cold, wintry days! A hearty dinner and so flavorful. We enjoyed this soup so much!